geek with curves: Rancho Obi-Wan Feature in Star Wars Insider! Star Wars Insider #149, the May/June issue, is available in stores now and contains a feature article (my first) all about Rancho Obi-Wan by yours truly. 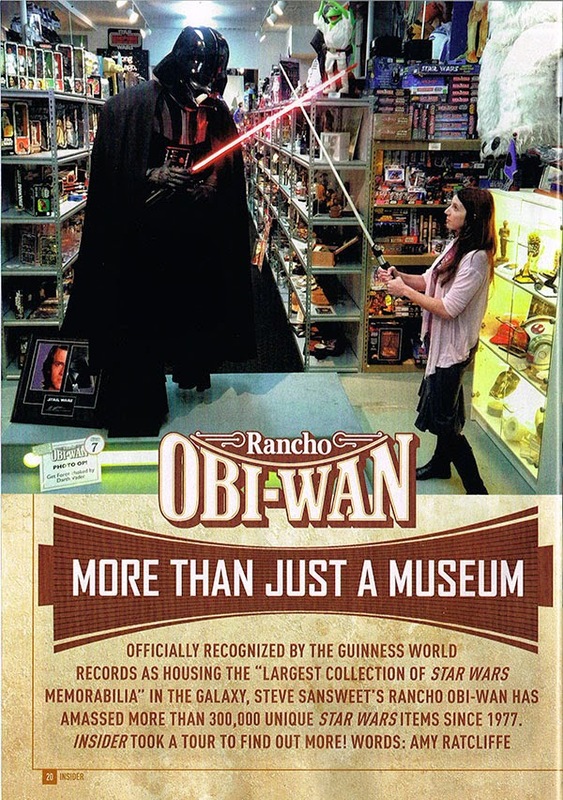 Rancho Obi-Wan houses the largest private Star Wars collection in the world, but it's more than a museum - it's a place to witness history and the huge way that Star Wars has affected our culture. I interviewed Steve Sansweet for the article and besides hearing about why Rancho Obi-Wan is important and magical, you'll also see items in his collection including five cool fan made items and five weird food items and read quotes from James Arnold Taylor, Cat Taber, and Sam Witwer about why ROW isso meaningful. Pick it up today and let me know what you think of the article and if you end up getting a ROW membership! Annnnd a place that is on MY list to visit. Thank you! It is definitely an good webpage!